You can buy a copy of The Story of Doctor Dolittle by Hugh Lofting at Barnes and Noble and BooksAMillion (I believe these are the bowdlerized versions) or read the original version for free through Amazon and Project Gutenberg. No one loves and understands animals like the eccentric nineteenth-century physician Dr. Dolittle—who masters animal language with the help of Polynesia the parrot. After his human patients desert him, the kind-hearted doctor finds his calling in practicing animal medicine, and his fame spreads far and wide. When a terrible epidemic breaks out among monkeys in Africa, Dr. Dolittle sets out to save them, accompanied by some of his favorite pets. Thus begins the amusing, whimsical adventures of Dr. Dolittle and the animal kingdom. 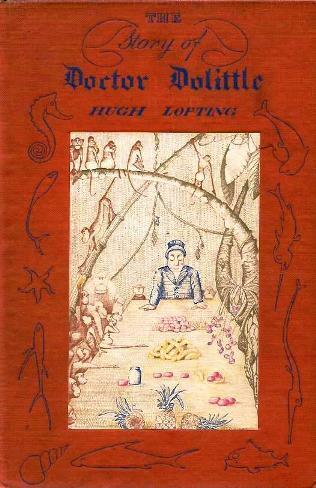 Hugh Lofting, winner of the 1923 Newbery Medal for The Voyages of Dr. Dolittle, has a gifted knack for imbuing unique, distinct personalities in his characters—human and animal alike. I read both The Story of Doctor Dolittle and The Voyages of Doctor Dolittle back to back, as part of my goal for reading all the Newbery Medal and Honor Books. And I chose to read the unrevised versions instead of the bowdlerized editions because those are the editions that garnered Newbery attention. Both books disappointed me. Racism that supports colonialism: other people have talked about this issue in more detail and readers can do their own research. I'm bringing the topic up because irritation as a response to that colonialism was the ONLY emotion that this book aroused in me (unless you count boredom as an emotion). I have no idea how the bowdlerized versions compare and I'm not interested in undertaking that task because I found the story to be dull. The story is unrealistic. Maybe a child can suspend their disbelief but I couldn't, not for this book. Lofting abandons the use of senses to world build. He's short on descriptions. He doesn't paint a picture of England, let alone Africa. There's no descriptions of plants or weather or even the real-life animals. Nothing smells in Lofting's world. There's no sense of environment, which is something I expect in a book that's supposed to be about animals. Except, it isn't about animals. Lofting's creatures might as well have been human because there's nothing animal about them. They can fly or swim or climb but they only use these skills in the way that a human would use them. The anthropomorphism is done in a way that supports the colonialism, with each animal displaying the same behaviors and attitudes with little variance sorting them into unique characters, encouraging the notion that this is how people should walk/think/talk/act. Pfft. Screw that (beYOUtiful).